Do Lawyers Get Paid For Pro Bono Work? In the law world, many attorneys are asked (if not required by the state or their firm) to take on pro bono cases every so often, either to promote the firm’s agenda or as a public service to an individual or a group of people that can’t afford to stand up to a government entity or large company on its own. Pro bono work can also be taken if a case will be highly publicized and winning the case could mean a high level of recognition for the lawyer – and perhaps future clients. Pro bono means what it means – it is Latin, meaning “for good” (or the public good, as it is short for “pro bono publico”). An attorney who works pro bono generally does not get paid for the work on the case, not by the parties in the case. Some pro bono work can be free for the parties, but the lawyer may be paid by a third-party entity with a vested interest in the case (such as an abortion case that might be paid by Planned Parenthood, for example). So that might beg the question, why would an attorney do a lot of work for a pro bono case, when there is no financial benefit from it? Most pro bono cases are about passion for the attorney. Passion for serving, passion for publicity, passion for the cause of which he or she is standing, all can be ways that an attorney gets “paid” for pro bono work. The work comes from the heart, and often an attorney just might work as hard or harder in these cases than in others where he or she is making billable hours. Pro bono cases are usually not assigned to the attorney – the attorney usually gets to choose the causes, cases, and clients he or she takes on. If the attorney knows and expects to not get paid for the work, he or she will usually want or need some motivation to take the case, so that the attorney will put forth the work and energy to win the case. Winning the case may mean more business later, some of which will be paid. Attorneys can often consider these cases an “investment” in the business. In order to cover the “loss” of income, attorneys will often cover pro bono cases through charges to paying clients. How many pro bono cases an attorney will take may depend at least partly on how lucrative the practice is and how much time the attorney can “afford” to spend with no billable hours. 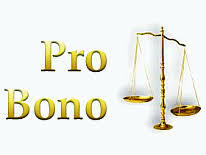 Pro bono work is part and parcel of the legal profession with many attorneys. It is a form of charitable service that can often give attorneys a sense of purpose and mission to their practice, outside of money. Attorneys can sometimes get a bad rap, and pro bono work (and wins in these cases) can help burnish the image within the community in which these attorneys serve.